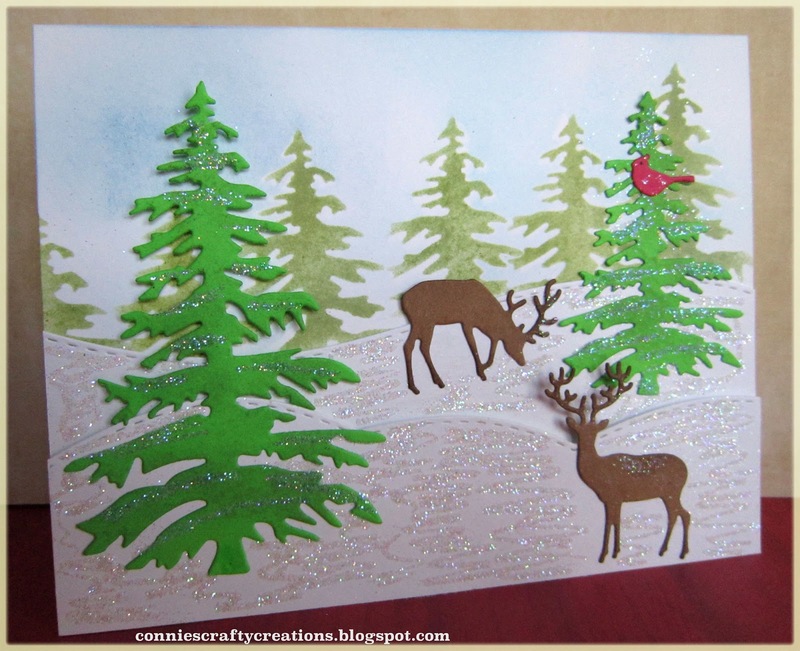 Hi, Connie here with you today with a winter wonderland card. I am using this card as a Christmas card but I left off any sentiment just in case the one receiving it would like to keep it displayed all winter long. I think it would make a nice Birthday card for the season too. I like to use my dies in all kinds of ways and today not only did I use them for their intended purpose but I used them as a stencil. I wanted to get the look of trees far off in the background. I started with a piece of transparency the same size of my card, you could use acetate or even old packaging from craft supplies. 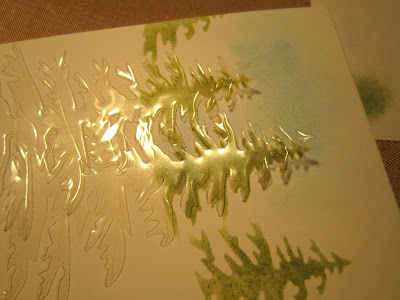 If you don't have either you can use cardstock, I just wanted to be able to see through my stencil. 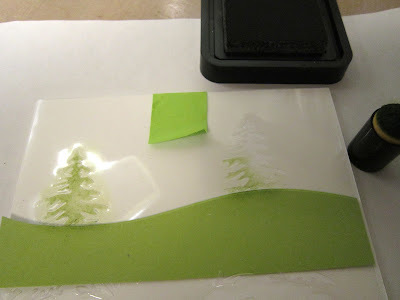 I took a scrap piece of the Poppystamps stitched landscape die to give me an idea where I wanted them to be on my finished project and cut out two of the Frantic Stamper small Oregon fir die. You want the trees to look smaller so only use the top of the trees for the background, here is a picture of both cut out and using a dauber and ink filling in my stencil, I went with an up and down motion for the stenciling since there were so many jagged edges on the tree. The green tape is just there to hold my stencil to my card base. To get the blue sky background I used the two pieces I cut out and applied them over the trees I had stenciled and sponged in the blue sky. 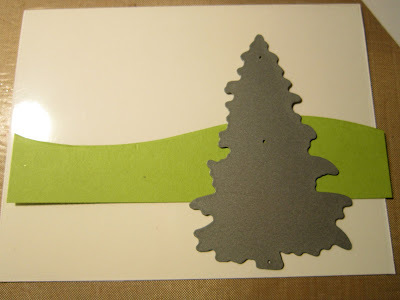 I cut two pieces of the stitched landscapes for my background, using foam tape to lift the top piece for dimension. As you can see I have one tall tree and one smaller, I didn't realize that we no longer have the larger tree anymore we just have the small. I also used the Impression Obsession small deer and inked them up a little bit. HERE is a link to the deer in the store. 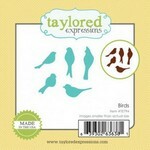 I used Poppystamps Cheery cardinals, but the store is out of those too but you could use Taylored Expressions birds. 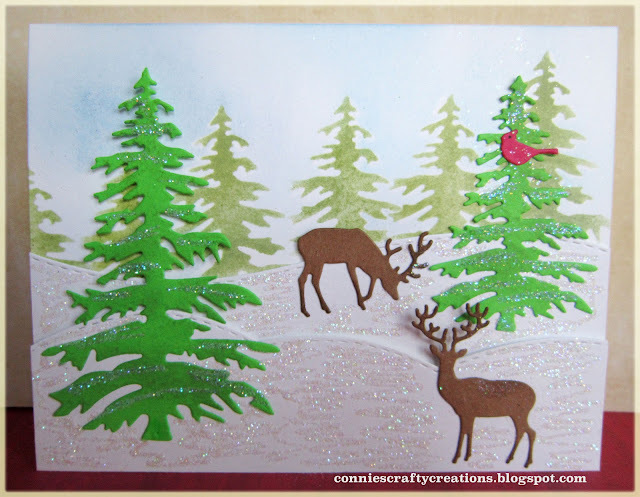 After it was all done I used my glue pen to add glue all over for the snow and added glitter to it. You can see a little more of the dimension in this picture. Totally Frame Worthy! Love your forest of trees and your snowy slopes, especially with all of that sparkle! The deer set the stage for a pretty winter scene. So serene! WOWZA! This is awesome Connie! Love the depth you got in your scene by putting your 'smaller' trees in the background and beautiful full trees in the foreground ... what an awesome winter scene you've created! Well done! Thanks for all the fabulous details and inspiration! Great scene card, Connie. The colors of the trees make it look like you are right there in the midst of it all with the deer. Super card Connie, such a fantastic scene. The trees are brilliant with the deer in front. A great tutorial. What a lovely card Connie! 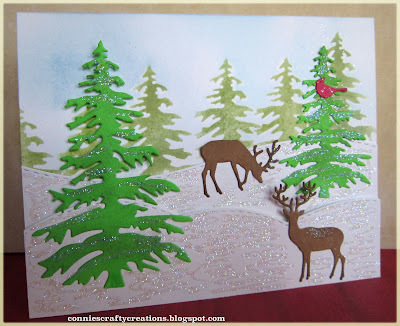 You did a great job creating the trees in the background and bringing the larger trees forward. Just like a walk in the woods. I love the little pop of red from the cardinal. So serene and definitely frame worthy! !